Disney parks are always magical. 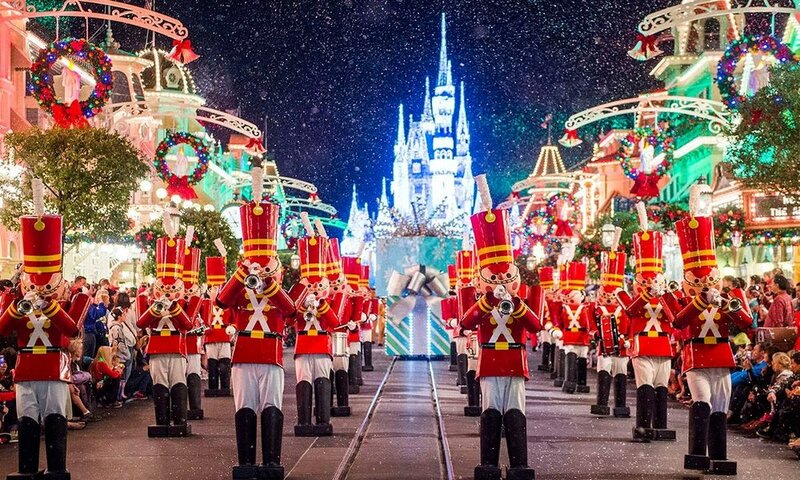 But during the holidays, the magic reaches another level, with special parades, parties, food, and decorations. Seeing the Disney parks decorated for the different holidays is spectacular. In the fall, pumpkins and foliage line Main Street U.S.A. At Christmas, not only is the street decorated, but an enormous tree greets visitors as they enter the park. And at the end of Main Street USA, the castle is dripping with white lights. It’s breathtaking! Every evening after the sun has set, the cast from Frozen gathers in front of the castle as Ella uses her magic power to bring a Winter Wonderland of dancing icicle lights to Cinderella Castle. Guests also enjoy the international Christmas trees at Epcot and the art deco holiday decorations at Hollywood Studios. The holidays bring special events to Disneyworld, and most are included in park admission. Epcot celebrates with the International Festival of the Holidays and offers holiday food, a candlelight processional, and a special festive version of IllumiNations: Reflections of Earth. At Hollywood Studios enjoy Jingle Bell, Jingle BAM!, a fireworks spectacular with holiday music, special effects, and state-of-the-art projections. You can also enjoy special touches at just-opened Toy Story Land. Mickey’s Not-So-Scary Halloween Party and Mickey’s Very Merry Christmas Party are ticketed events that include specialty holiday foods, parades, and easy access to park attractions. With lower crowds in the parks during the parties, lines for attractions will be much shorter than usual. Dress up and trick-or-treat at the Halloween party, the Happiest Haunting on earth! The Boo-to-You Halloween parade and the Happy Hallo-Wishes Fireworks Show are just right for even the littlest goblins. At Mickey’s Very Merry Christmas Party enjoy a visit with Disney favorites decked out in their holiday best as well as Santa himself! A Frozen Holiday Wish will transform the castle, and Once Upon a Christmastime Parade comes complete with falling snow. Complimentary seasonal beverages and sweets are available throughout the park. Disneyland has its own unique festivities. The Haunted Mansion receives a “Nightmare Before Christmas” makeover, and It’s a Small World has a special holiday version. And you won’t want to miss the Christmas Fantasy Parade or the “Believe . . . in Holiday Magic” fireworks spectacular. Disney resorts have their own special Christmas décor. Guests will find awe-inspiring Christmas trees themed to each resort. The Grand Floridian Resort and Spa boasts life-sized gingerbread houses as well an enormous Christmas tree. The Beach Club has a carousel designed by pastry chefs that is sure to impress any Grinch. The trees, garland, and wreaths at the Yacht Club hold every kind of boat you can imagine. The nautical details are amazing – you can even find a life jacket and binoculars. Guests can also celebrate the holidays with Disney Cruise Line. In October, Halloween cruises include Mickey’s Mouse-querade party, complete with games, trick-or-treating, and favorite Disney pals dressed in their Halloween attire. Other activities include pumpkin-carving, mask-making, and ghost stories told campfire-style up on deck. Adults aren’t left out of the fun – they have their own Halloween party that includes a costume contest. At Thanksgiving, guests are served a complete Thanksgiving dinner and are joined by Disney favorites dressed for the season. And of course, football games are shown on the outdoor jumbo LED screen. Mickey’s Very Merrytime Cruises include special parties, a tree-lighting, and visits with Santa himself. Special holiday crafts and storytime will keep the younger cruisers entertained. And even Disney’s private island, Castaway Cay, has festive decorations! If you’re sailing on December 31st, you will enjoy a special dinner menu, a New Year’s Eve deck party, and holiday fun for guests of all ages. The very best part of holidays at Disney parks is spending time with those you cherish most. What a treat to get away from the hustle and bustle of your daily life and focus on your family and friends at the Happiest Place on Earth!